"We learn nothing from our winners", was how popular market commentator and interviewer extraordinaire Barry Ritholtz put it on a recent Masters in Business podcast (see here). I’ve read similar things in other investment books and articles. It basically boils down to the fact that nobody's perfect and that it's best to learn from your mistakes. Traders I know call it tuition. We need to pay money (lose) in order to learn a skill. Warren Buffet’s partner Charlie Munger, put it another way: “It's a good habit to trumpet your failures and be quiet about your successes". This blog post is me tooting my own broken, bandaged, tail-in-between-my-legs, trombone. 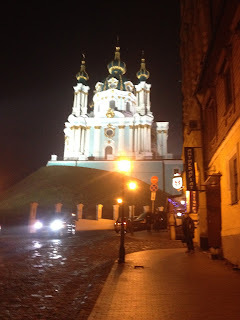 I wrote about Ukraine in two posts. They were based on my February 2014 trip to Kiev (see here and here). I came away from my trip thinking that the uncertainty caused by the Ukraine/EuroMaidan Revolution marked an economic and stock market bottom. This was not the case and both have fallen even further. In mixed company and presentations I mostly blame the currency. And numerically that accounts for most of my loss. The Hryvnia declined by 67% vis-à-vis the USD since my initial investments in March 2014. In contrast my portfolio of Ukrainian stocks is down about 50%. The 17 percentage points of ‘alpha’ (or excess returns) is little solace when I’m down by half at a time when other markets have risen. However the currency decrease hides the fact that I made some real investment blunders. The biggest mistake was not sticking to my investment process. If I had, I would be wealthier and have slept much better. I could see from my Hong Kong base that Ukrainian stocks were cheap on almost all traditional valuation metrics. The key reason for the trip – indeed all trips - was to determine if the cheap stocks were of any value. It’s like buying clothes on the Internet. They may look like a bargain online, but if the size is wrong, the material cheap, and the stitching poor, it’s just plain cheap. Cheap is the inexpensive shirt that hangs unused in your closet. Value is the inexpensive shirt that makes you look good and feel confident. Moving from the cheap to value category is where my people and structure factors come into play. Instead of sticking only to companies run by good people and have simple corporate structures, I invested in companies that were very inexpensive on many valuation measures, but were owned/controlled by people who are not likely to be good to minority shareholders. One example is the country’s largest oil and gas company, Ukranafta. It was jointly held by the government and the Privat group. The Privat group is headed by Igor Kolomoyskyi, one of Ukraine’s richest men and an archetypical "oligarch", meaning he has both economic and political power. He has a less-than-stellar-reputation according to Kiev locals who described him in much more colorful terms. Despite this I thought that it being Ukraine’s largest energy company and its cheap valuation made it a good investment. Its shares were at 3x EV/EBITDA when I bought it in early March 2014 (EV/EBITDA is one of many financial ratios used in an attempt to value a company. Generally a low ratio is preferable to a high ratio. More information can be found here). Since then, the Privat group is believed to have stifled company reforms, blocked dividend payments, and transferred profits out of the listed company and into other group companies. In March 2015 Kolomoyskyi used his privately-funded armed guards to defend against a "raider attack", after Ukraine’s parliament passed a law that took away Privat’s veto power at the company (see here). The share price reflects a lot of these problems and is down some 80% in USD terms since I bought a stake. Another way to look at this is that the same stock now has to increase five times for me to just break even. Sunk cost is cost that has already been incurred and cannot be recovered. In investments it typically refers to irrationally sticking with a stock that’s already gone down despite better choices. If we have committed to something, our brain has a fierce resistance to believe it made a mistake and we are inclined to go down with the ship. I stayed invested in Ukraine despite Russia taking over Crimea and a bloody war in Eastern Ukraine. As a reminder, almost 10,000 have been killed and over 20,000 injured in Eastern Ukraine, which likely makes it the largest number of people killed in a European armed conflict since World War II. The old Rothschild attributed-adage, "buy when there’s blood in the streets", did not work. After spending time and money going there, I felt I needed to recoup my investment. It would have been better to cut my losses, and just think of my trip and expense as tuition. In fact I increased my investments after elections were held in the Spring of 2014 and the person I thought would do a good job, Petro Poroshenko, was elected. I was warned about the folly of buying Ukrainian stocks before I went. This only increased my desire to go as I was told the same thing before I went to Greece the previous year. My investments did very well there, with several more than doubling. Thinking like a trader rather than as an investor, I forced myself to buy stocks in companies I normally would not have, as all the market signs pointed to Ukraine as being the ultimate contrarian play. I thought I would look like a fool if I missed the boat in Ukraine after telling people I went there. Instead I look like a fool now. A poorer fool. Virtually all the financial people I met there were way too optimistic, especially after the end of the Maidan protests when local brokers really pushed Ukraine stocks. Nobody expected the currency to fall so much despite it being very weak. Only one investor – a very smart man from Minsk – correctly hypothesized that Russia would not let Kiev get closer to Europe without some sort of response. Even an educational trip to the national museum where I learned that Ukraine was part of Russia for a long time and that it is essentially a Soviet creation, did not dissuade me. Nor did an ex-military friend who correctly pointed out that there is no significant natural barrier between Ukraine and Russia. Locals in Kiev – even those whose first language was Russian – were convinced Ukraine is clearly a European country and would soon be in the EU if not NATO. Ukraine’s cheap prices and investment success in Greece the previous year made me greedy. I remember sitting in my Kiev hotel room salivating at the low valuations of Ukrainian stocks. But even low valuations don’t mean much if the quality is not there. I essentially made things work in my mind. I justified poor quality by thinking that at these valuations things can only get better, and put my blind faith in what brokers told me, rather than insisting on meeting management and doing my own work. Ukraine’s cheap valuations made it hard not to invest, and I did not wait for the currency to depreciate further. I did not wait for poorly managed companies to work out their problems. I did not keep money on the table to invest at lower prices. Greed made me impatient. Ukrainian companies are not investor friendly. Only one locally-listed company wanted to meet. It wasn’t just me; almost no companies were interested in meeting with investors. Even the "blue-chips" were not investor friendly. One of my worst ever meetings was with Ukraine’s largest pharmaceutical company. “I don’t have to answer you!” was how the head of business development sternly put it when I asked pretty standard investor questions. Even after explaining that I was already a small shareholder and I wanted to better know the company because I was thinking of increasing my stake, he must have thought I was engaging in corporate espionage. When he found out I was not interested in buying products, he abruptly ended the meeting and cancelled the plant visit. I should have sold immediately and taken the 10% loss. Instead I waited and the shares are now down over 50%. Some companies in Ukraine are shareholder friendly, and these seem to all be listed someplace else, mostly on the Warsaw and London stock exchanges. Many have dedicated investor relations professionals who are keen to explain their companies. While I've taken it on the chin, my Ukraine experience actually reinforces my belief that my investment strategy and process work. One of the few companies I found that fits my people, structure and value model turned out to be my best investment there. Kernel is a Warsaw-listed, Kiev-based agricultural company that is open to meetings, has good investor relations, a simple corporate structure and a solid owner/management that’s been buying shares. Its valuation was higher than most Ukraine-listed companies, but it was certainly not expensive. Since then it’s started to pay dividends and its share price is up close to 60% in USD. ● Widespread reforms. The European Commission calls Ukraine’s reforms unprecedented (see here). ● Cleaning up the banks. A recent Financial Times article noted that cleaning up Ukraine’s banking system has been one of the country’s most successful reforms since the 2014 revolution. Its central bank, The National Bank of Ukraine, has closed 80 out of 180 banks. It’s too early to say that cleaning up the banks will lead to a positive credit cycle but it’s certainly a large step in the right direction (see here). Just before Christmas government nationalized PrivatBank, the country’s largest, due to large scale-related-party lending. PrivatBank is owned by two oligarchs, one of whom is the same Kolomoyskyi who controlled the oil company where I lost so much. The authorities estimate that about 97% the bank’s corporate loan book was to parties related to its owners (see here). ● Clipping oligarch wings? Taking away two large assets from a powerful, well-connected (and many believed to be well-armed) oligarch is a bold move and a sign that government institutions could be growing stronger and, hopefully, fairer. ● Return to growth. GDP grew in 2016 and is expected to increase by 2.3% in 2017. Not rapid growth, but certainly better than the 6% and 10% respective decreases in 2014 and 2015 (see here). ● Rising market. The UX, the country's main stock market index, is up over 40% in USD terms from its April 2016 low. Stock market performance tends to precede economic performance. One of the best performers during this time was Centranergo, the country’s largest listed utility. Its share price more than doubled when it was announced that it will be privatized. ● Geopolitical stalemate? The eastern Ukrainian conflict seems to be a stalemate. It could flare up again and remains a key risk. But it seems to have reached some sort of ugly, unresolved détente. ● Getting easier to do business. Between 2014 and 2016 Ukraine climbed from the 152nd to the 80th position in the World Bank’s Doing Business Report. This was mostly under President Poroshenko’s leadership. A businessman himself, he wants Ukraine to climb another 30 positions (see here). ● Increasing tourism. Flights to Lviv are up 30% since last year. I’ve not been there, but from what I’ve read it seems like the Kyoto of Ukraine with a modern yet traditional vibe (see here). ● Improving companies? More importantly for equity investors, such as yours truly, Ukraine’s companies are showing some green shoots. ■ The pharmaceutical company that refused to answer my questions joined the Ukraine Corporate Social Responsibility Development Centre in early December 2016; and brokers say one of their lenders is putting pressure on management to honor minority shareholder rights (see here). ■ The ex-oligarch-controlled oil company’s top management is all new since 2015, oil prices have increased, and Ukraine is determined to break its dependence on Russian energy. ● Political stability for now. But has anything changed? With nobody going to jail for past misdeeds one wonders if anybody in Ukraine has the power, will and means to clean up the system. The next election has to be held before November 2019 so there will hopefully be some stability and further progress before domestic politics starts heating up (interesting article here). If anything this experience has made me believe in my process more. My biggest mistake of all was deviating from my investment rules. If I had stuck to my simple focus of investing only in companies owned and run by good people, that have a structure that aligns majority and minority shareholder interests and that have value, I would not have made the many mistakes described above. One reason I now repeat the same first paragraph in all blog posts is to remind myself to focus on three things that matter – people, structure, and value. It’s been a tough lesson. Hopefully I’ve learned from my mistakes. Thanks for the article! Have you taken a closer look at Bank Aval?